○Automatic preform input and ready bottle output system. ○Machine adopt with the overall structure of super-standard anti-vibration design,high-speed operation state of the machine will shake down to a minimum,and ensure that the life of components using will not affected from mechanical vibrations. 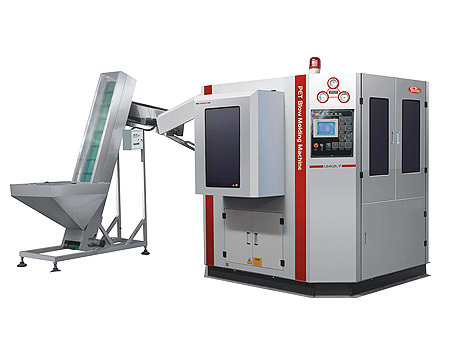 ○Machine adopt modular assembly methods,greatly decrease the local amendments due to technological improvements when the machine is on processing. ○In order to ensure the rate of fonished products,the oven which used in measuring the performance of the machine,sit in a very important position.The structure oven adopt the intemational most advanced energy-saving technology of infrared radiation heating,temperature control with automatic negative feedback,closed-loop regulation model. ·Actual discharges depend on bottle shape and preform qualification. ·The above technical parameters are subject to continual update,please rake the real product as the base.